Massage: Traditional Thai massage is a type of massage that involves stretching combined with deep massage. It is usually performed on the floor and the client wears the provided comfortable clothes to allow for stretching movements. No oils are used in Thai Massage however hot herbal treatment can be applied. A Thai Herbal Compress enhances the effectiveness of massage. Heat is compressed onto the muscle causing the active medical ingredients from the herbs to be absorbed through the skin. It helps relieving muscle stiffness, reduces swelling, joint inflammation, muscle spasms, joint congestion. It is an effective combination to improve blood circulation and reduce soreness. The ingredients of the Thai Medicinal Herbal compress include: Turmeric, Curcuma, Lemongrass, Kaffir Lime, Tamarind leaves and Pandan leaves. Signature PloyThai massage 90 min $130 - combines swedish massage and the warm medicinal herbal compress for rejuvenation and balancing of mind and body. The swedish technique focuses firm pressure with attention to connective tissue. An organic coconut oil is used to lessen chronic pain by relaxation of muscles with steam herbal treatment. Threading: Threading is a traditional Oriental method of hair removal. A thin cotton thread is doubled then twisted. It is then rolled over areas of unwanted hair, plucking the hair at the follicle level. It provides more precise control in shaping eyebrows. 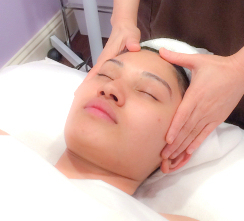 Facial: Steam, cleanse, exfoliate, extraction, including neck and shoulder massage. Waxing: Waxing gently removes hair with minimal irritation, leaving your skin silky and smooth. Experienced Professionals.